Languages always change when we change. Evolutionary speaking and over long period of time. Especially when we mix with others or change environment and move to different places. English is perfect example - perhaps it is the only language spoken with that many variations created from country to country, all over the world, from New Zealand throughout India toward Canada and even in those places on Earth where it is not language number one. Believe it or not, there are thousands of spoken languages throughout our planet today and with people migration over eons, mixing multiple languages into new ones are well recorded in our history. 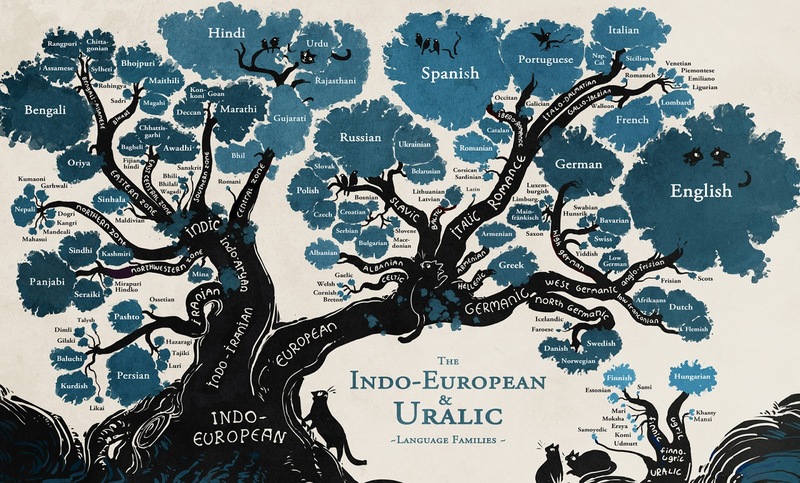 New languages created in that fashion are well known as creoles, most of them connected to the recent colonialism when two cultures or more collided for a longer period in time. Perhaps the most known of them all (and spoken by most of their population) are Haitian, Jamaican and Hawaiian creoles - mixture of French (Haiti) and English (Jamaica and Hawaii) base with influences of other European languages (Spanish and Portuguese), West African, and domestic. But there are other type of creoles - i.e. in the literature and movies (somebody thought Klingon? ), perhaps the coolest of them all is Belter Creole (The Expanse series) invented by Nick Farmer* with words taken from English, Chinese, Hebrew, Persian and dozen more. For example "Den ta desh lik bodzha" in belter means, if I am not mistaken and from the context, something like "It looked like a big explosion". But we don't need to go that far into history or fiction. Within only couple of decades of the internet, in the world of abbreviations and acronyms we, even today, need extra vocabulary power to understand the urban slang and new words in written context. Let me 'invent' a sentence from the modern technocracy - "Dude, diy asap. Btw afaik, * is in faq! Yolo man!". And this is the translation: "Dude, do it yourself as soon as possible. By the way, as far as I know, everything is in 'frequently asked questions'! You only live once, man!". Ok, after perhaps too long and utterly unnecessary introduction which is probably more suitable for some other topics, let's talk in this post, or to better say let's watch, about one of the new internet words. DIY. In realm of home science experiments published on YouTube. By zviktor22 and mpj. Well.. us.. Viktor and me. So, enough about languages at least for now and let's dive into YouTube phenomenon in latest years with series of DIY videos published by many youtubers in various fields. We, kind of, started with this even earlier with our "Little Chef", cooking thread and it was only logical to, by following our host age, go into other waters as well. DIY was practically waiting for us to start and with these three video clips we are introducing new playlist in zviktor22 YouTube channel and new thread on this blog. Of course, both of us didn't want just to copy similar clips on the net so we established a rule that in order to publish, it is mandatory to add our own twist or change of recipe or something new that wasn't done before. For the very first DIY clip, we chose to grow a snake from the sugar and baking soda. There are plenty of other channels and videos dedicated to this endeavour so in order to offer something they didn't - we wanted to plant five snakes in the same time. We pretty much succeeded in the effort, and while not all five rose in the same length, we managed to do what we wanted. 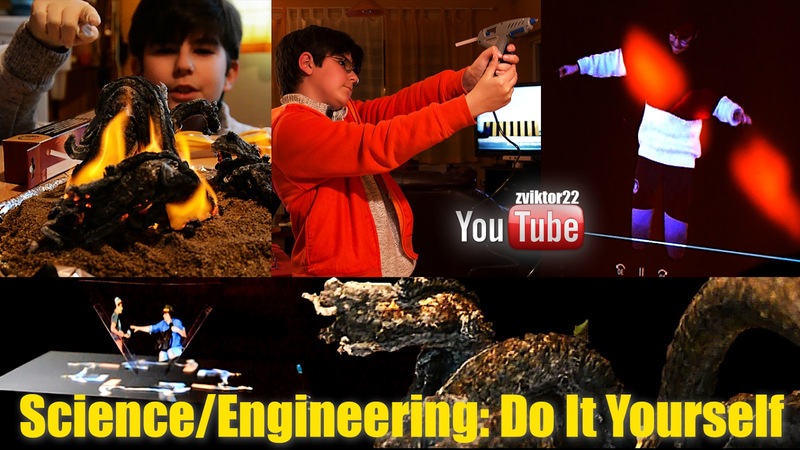 It was huge success (comparing to all of our other tries-and-fails before filming in order to perfect our skills) and it went somewhat popular and not long after we published it online, Viktor was asked to perform the experiment in front of his and two neighboring school classes as well. There are also photo snapshots from the video and class demonstration and you can see it in Black Snake Photo Gallery. We also included a chemistry behind in the video adapted for 10 years old pupils so we were both happy with how it all happened and played out. The latest video is 3D hologram craft for smartphones and tablet computers. This was not new and it dated about two years back went it went viral on the YouTube and it was difficult to make a difference so what we did was to make both, tablet and smartphone pyramids in the same time and also, with one more step forward, to make our own holograms as well. Well, while we succeeded to make videos, they were not 3D per se - to do that a camera with two lenses was required (or filming from different angles in the same time) so we cheated a little and filmed in regular fashion in front of yellow wall, which we turned into black in post processing, but within a pyramid view it stayed, semi-3D, so to speak, which pretty much means it was great looking in the darkness, but only from one direction. Nevertheless, the result was great visually and I decided to adapt one more video - the dialog from the Game of Life, we made last summer which we filmed in front of green screen. Seeing it in the pyramid was an extra perception and along with usual 3D videos online this DIY was one of the best we made so far. Perhaps, we didn't do great job in explaining everything in details, or to do crafting itself, but I like to think that this one is pretty straightforward and self-explanatory. Finally, the shoebox projector was giving us tons of fun, with glue gun and not-so-simple turning a shoebox into projector. The background was of course to use a smartphone, turn its brightness to the max and project the image through the lens taken from magnifying glass to the wall. After Viktor built it after couple of hours of filming, the only image we got was one big white blur on the wall. The lense simply refused to focus well, probably due to short focus distance designed for enlarging small letters and all, so we had to find another one to add it into the 'apparatus' and as soon as we did it, we were rewarded with one great image on the wall, or whiteboard we used to project. The only downside with this video was the same as with the hologram - filming in the dark with our modest camera was too difficult task and I guess you will have to take my word for it when I say that it was way better experiencing it live than watching it in the video. I tried to remove noise with usage of couple of filters in 'After Effects' and this is the best I could do. Well, that was it for the very first DIY post and I will conclude it with Viktor's words from the end of all clips: 'Hope you enjoyed the video, please like and subscribe and I will see you in the next episode'.